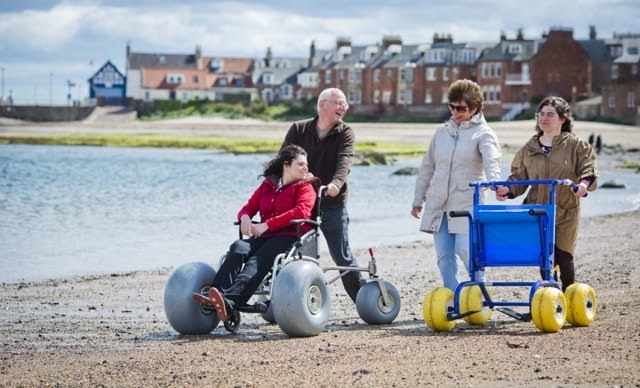 Loan of child's and adult beach wheelchair and walker in North Berwick. We are a charity providing beach wheelchairs for free loan to people with physical disabilities. We have a child's beach wheelchair with a full range of supports and an adult's beach wheelchair as well as an adapted walker that can be used on the sand. To use this equipment please phone our booking line on 0300 111 2112. The 2 adult wheelchairs and walker should be collected from our Beach Hut in North Berwick Harbour from one of our trained volunteers. We now have a hoist and can carry out chair to chair transfer with the hoist operated by one of our trained volunteers.